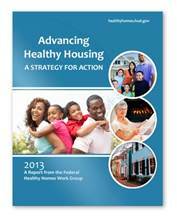 On February 4, 2013, HUD, with the U.S. Department of Energy, U.S. Environmental Protection Agency, U.S. Department of Health and Human Services, and the White House Council on Environmental Quality unveiled Advancing Healthy Housing – A Strategy for Action. Goals One and Two: Establish and Encourage Adoption of Federally-Recognized Criteria for Healthy Homes. The Strategy for Action calls upon federal agencies to develop consensus on the basic concept of a healthy home – building off eight characteristics, including dry, clean, Pest-Free, safe, Contaminant-Free, well ventilated, and well maintained and thermally controlled – and encourage adoption of this consensus across federal agencies, tribal governments, state and local governments, and non-governmental organizations. Goal Three: Create and Support Training and Workforce Development to Address Health Hazards in Housing. Building a cadre of trained experts that deliver healthy homes services, including weatherization and retrofitting in neighborhood homes is at the core of the Strategy. The plan includes leveraging existing workforce development efforts, such as Department of Labor’s efforts in training workers for, and connecting workers to, jobs in a clean energy economy and green construction. Goal Four: Educate the Public about Healthy Homes. The Strategy promotes adoption of a public communications campaign to help people connect the dots between their health and their home. Goal Five: Support Research that Informs and Advances Healthy Housing in a Cost-Effective Manner. The Strategy identifies areas in which rigorous healthy homes research is needed to help federal, state, and local stakeholders enhance their decision-making in a cost-effective manner and reduce actions that have unintended consequences. On February 4, 2013, HUD, with the U.S. Department of Energy, U.S. Environmental Protection Agency, U.S. Department of Health and Human Services, United States Department of Agriculture , and the White House Council on Environmental Quality unveiled Advancing Healthy Housing – A Strategy for Action.